i love experimenting with ingredients to create a flavorful update to an already delicious recipe . This is a winning combination. I kept it simple using store bought cornbread along with sausage meat because dressing really does taste good with sausage meat. It’s a big Thanksgiving tradition in my family. I added to this many of my favorite flavors of the season, dried cranberries, walnuts, fresh rosemary and of course sage. The result is a great side to any holiday feast! From by the bay , wishing you flavorful dressing food memories! To make dressing place a large skillet on medium heat and cook sausage, crumbling the meat with a fork until fully cooked, about 10 minutes. Remove meat with a slotted spoon and place into a large mixing bowl. Add butter to the same skillet, melt butter and then add the celery and onion. Saute ingredients together until softened about 10 minutes. Add garlic and saute another minute. Add the walnuts and herbs cook another 1 to 2 minutes. Remove from heat and add to the bowl with the cooked sausage meat. Add the bread cubes, cranberries and 2 cups chicken stock to the bowl. Mix the ingredients together and season with salt and pepper. If the dressing is dry add more stock. The dressing can be made up to this point one day in advance and refrigerate until ready to bake. Remove from refrigerator and allow to come to room temperature. Place dressing into a lightly buttered baking dish. Bake in a 350 oven for 30 minutes. Remove from oven and serve warm. This entry was posted in side dish and tagged cornbread recipes, cornbread sausage and walnut dressing, cranberry recipes, fall recipes, pork recipes, rosemary recipes, sage recipes, sausage recipes, sausage stuffing recipes, stuffing recipes, Thanksgiving recipes, walnut recipes on November 19, 2018 by entertainingbythebay. Looking for the perfect turkey recipe? Here is one you will love, after years of using wet brines for my turkey preparation, I have shifted to dry brine with outstanding results. Why a dry brine? Well the taste is great which is the most important reason but besides that the brining time is faster, storing the turkey is easier and it requires a lot less effort. Let’s be honest, if you are preparing a Thanksgiving meal, you need to find ways to make it all easier. Give yourself a break or just try a different approach this holiday and enjoy ! 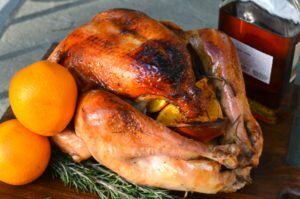 From by the bay, wishing you tasty dry brine turkey food memories! One day before serving, rinse turkey and pat dry. Rub dry brine all over with turkey including under skin where possible and rubbing some into cavities. Use about 1 tablespoon per 4 pounds of bird. Wrap bird in a large plastic bag and place in refrigerator. A couple of hours before cooking, remove turkey from bag and pat dry. (There is no need to rinse it first.) Place in roasting pan and allow to come to room temperature. Heat oven to 450 degrees. Truss legs with kitchen twine. 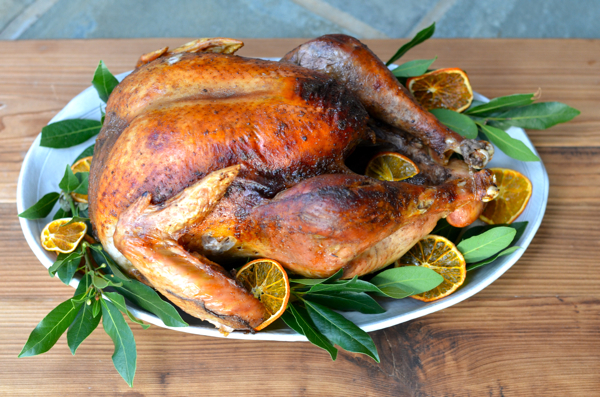 Put oranges and bay leaves in neck opening and tuck neck skin under bird. Rub butter under breast skin and onto thigh meat. Roast for 30 minutes. Remove turkey from oven, reduce heat to 350 degrees and cover breast of bird and wing tips with foil. Add 1 1/2 cups chicken or turkey stock to bottom of roasting pan and roast bird for another two hours, depending on size; figure 12 minutes a pound for an unstuffed bird. Remove foil in last half-hour so breast browns. When turkey has roasted for 2 hours, begin to test for doneness by inserting a meat thermometer (digital is best) into two places in thigh, making sure not to touch bone. It should be at about 160 degrees. When roasting is done, tip turkey so interior juices run back into pan. Remove turkey to a separate baking sheet or serving platter, cover with foil and then a damp kitchen towel and allow to rest for at least 30 minutes. Pour fat and drippings from pan into a measuring cup. Deglaze pan with 1/2 cup chicken of turkey stock and pour that into same measuring cup. Fat and drippings can then be used to make gravy. In a medium bowl combine well all ingredients. Store in an air tight container until ready to use. 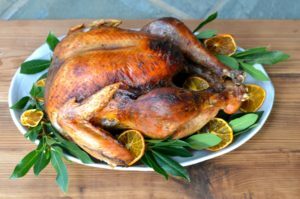 This entry was posted in main dish, poultry and tagged Allspice recipes, brine recipes, dry brine recipes, fall recipes, oranges, roast turkey recipes, Thanksgiving recipes on November 15, 2018 by entertainingbythebay. Wondering what to do with all the leftover turkey? Try this easy recipe using your turkey to make a delicious pad thai. It’s a light and refreshing dish, especially after the over indulging on Thanksgiving. Give it try. 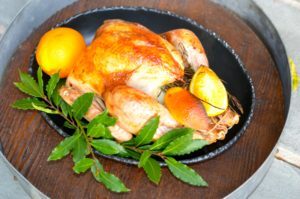 If you don’t have left over turkey save the recipe for when you have leftover chicken or for a fast weeknight dinner use a store bought roasted chicken. From by the bay wishing you delicious leftover food memories! In a small bowl place all the ingredients for the sauce, whisk well and set aside. Heat 2 tablespoons of oil in a large saute pan. Add garlic, shallots and turkey. Heat for 1 to 2 minutes until the garlic and shallots are softened. Set aside. Heat remaining oil, then add the eggs and scramble, reduce heat and add sauce, cabbage and noodles. Mix well. Add back the turkey mixture along with bean sprouts and mix well again. 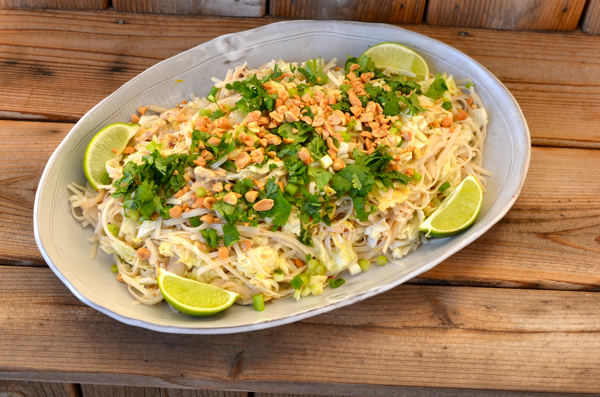 Turn pad Thai on to a platter , top with garnish and serve immediately. This entry was posted in main dish, Pasta and tagged brown rice noodles, cilantro recipes, leftover recipes, peanut recipes, thai recipes, Thanksgiving recipes, turkey recipes on November 26, 2016 by entertainingbythebay. No Thanksgiving meal would be complete without a side of potatoes and this sweet potato dish is a perfect side. 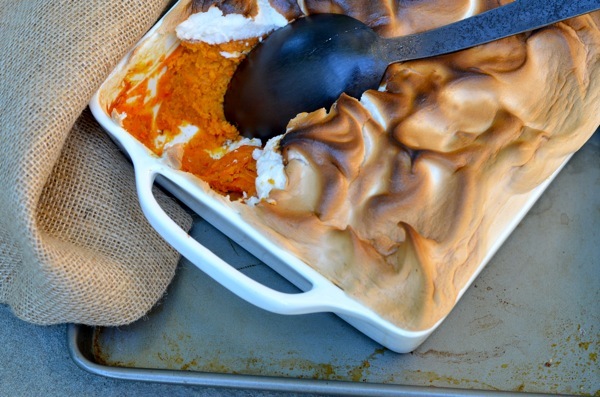 Creamy sweet potatoes are enriched with creme fraiche, touched with sweet cinnamon and then topped with clouds of marshmallow meringue made with marshmallow creme that is toasted last minute and served. Thanksgiving perfection! From by the bay, wishing you toasted marshmallow meringue food memories! Heat oven to 400 degrees F. Bake sweet potatoes on a foil-lined baking sheet 1 hour or until tender. Let cool to touch and peel. Reduce oven temperature to 350 degrees F.
Beat sweet potatoes, vanilla paste, and next 6 ingredients at medium speed with a heavy-duty electric stand mixer until smooth. Beat in whole eggs. Spoon potato mixture into a greased 8 by 8 inch baking dish. Bake at 350 degrees F for 30 minutes. Meanwhile, beat egg whites, remaining 1/2 teaspoon vanilla, and a pinch of salt at high speed with a heavy-duty electric stand mixer until foamy. Gradually add maple syrup, beating until stiff peaks form. Beat one-third of marshmallow crème into egg white mixture; repeat with remaining marshmallow crème, beating until smooth (about 1 minute). Pipe or spread meringue in a decorative pattern on warm potatoes. Bake 13 to 15 more minutes or until meringue is lightly browned. This entry was posted in side dish and tagged cinnamon recipes, creme friache, dark brown sugar, fall recipes, maple syrup recipes, marshmallow creme, nutmeg, sweet potato recipes, sweet potatoes with toasted marshmallow meringue, Thanksgiving recipes, vanilla recipes on November 21, 2016 by entertainingbythebay. 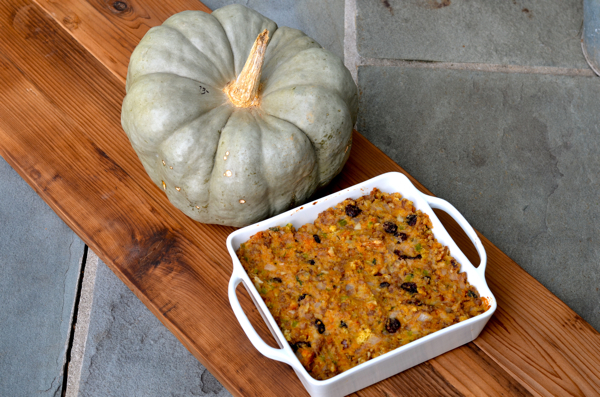 No Thanksgiving meal is complete without a great stuffing and/or dressing recipe. You can use this recipe to either stuff your turkey or bake in a casserole and serve on the side. This is a delicious savory dressing recipe, using whole wheat gives the dish a hearty , robust taste. 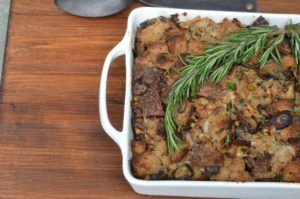 The mushrooms add an earthy taste enhanced by the roasting and it builds on the savory whole wheat. Preheat oven to 400 degree F. Place bread cubes in a single layer on two rimmed large baking sheets. Bake until toasted about 10-12 minutes. Set aside to cool. In another baking tray lined with foil add the mushrooms and olive oil. Mix well. Roast in the oven until mushrooms start to brown and become tender about 30 minutes. Set aside to cool. In a large skillet melt butter and then add leeks, chili flakes, thyme and rosemary. Saute together until softened about 10 minutes, separating the leek rings. Remove from heat and add to a large mixing bowl. Add the toasted bread cube, mushrooms, walnuts, vinegar and parsley to the bowl. Add chicken stock. Mix the ingredients together and season with salt and pepper. Add egg. Mix well. 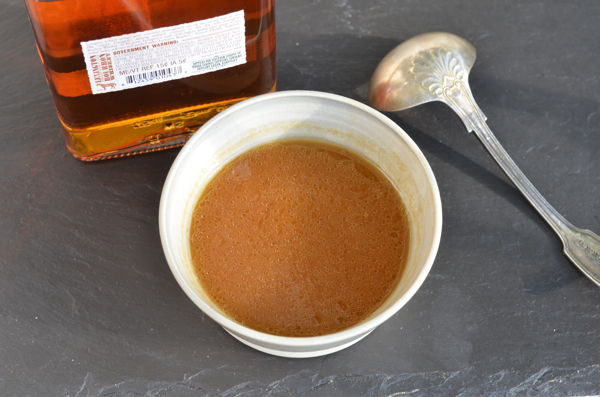 To bake the dressing, remove from the refrigerator and let it come to room temperature. Bake in a 400 degree F oven covered with foil for 30 minutes, remove foil and bake another 20 minutes until dressing is heated through the top is golden brown. Remove from oven and serve warm. This entry was posted in side dish and tagged dressing recipes, fall recipes, mushroom recipes, roasted mushroom and walnut dressing, rosemary recipes, stuffing recipes, Thanksgiving recipes, turkey side dishes, vegetarian recipes, walnut recipes, whole wheat on November 17, 2016 by entertainingbythebay. Thanksgiving is coming and to kick off this year’s recipes we start with the main event – maple glazed turkey that has been spent the night in a brine that includes both maple and bourbon. It’s an unforgettable turkey – moist and delicious , as well as beautiful. I’ll be posting recipes from now until Thanksgiving. Each recipe will build the menu for this year’s feast. Stop by again and again and don’t forget there are many additional recipes available to help you create the perfect Thanksgiving feast. From by the bay, wishing you special maple bourbon Thanksgiving food memories! Prepare brine by combining bourbon, water, sea salt, maple syrup, brown sugar, oranges, rosemary, apples, bay leaves and peppercorns. Stir to dissolve the salt and sugar. Clean turkey with cold water removing any giblets and or neck. Keep giblets and neck in the refrigerator to use later for gravy base. Place turkey and brine into a resealable plastic bag or into a large non reactive bowl covered with plastic wrap. The turkey should be covered with the brine, if not add more water. Refrigerate over night. The next day remove turkey 40 minutes before planning to place into the oven. Preheat oven to 425 degrees F. Remove turkey from brine and pat dry with paper towels inside and out. Season the turkey cavity with salt and pepper. Fill the cavity with the apples, orange and rosemary. Tie turkey legs together and place into roasting pan. In a small sauce pan melt butter and maple syrup together on a low heat. Use this to baste turkey once before placing into the oven. Roast the turkey at 425 degrees F for 30 minutes then lower the oven to 350 degrees F. For an 18 lb. turkey cooking time will be approximately 3 hours. Use a meat thermometer to check that the meat registers 175 degrees F at its thickest part of the thigh. Baste the turkey about every 30 minutes with the butter and maple syrup mixture. If the turkey browns too quickly tent that part with aluminum foil. When ready, remove from the oven. Take turkey from the roasting pan and place on a cutting board to rest before carving, at least 20 minutes. If you are serving later then 20 minutes from removing from oven tent turkey with aluminum foil until ready to serve. This entry was posted in main dish, poultry and tagged apple recipes, Bourbon recipes, brine recipes, fall foods, Maple Bourbon Roasted Recipes, maple recipes, orange recipes, roast turkey recipes, rosemary recipes, Thanksgiving recipes, turkey recipes on November 8, 2016 by entertainingbythebay. Here is a perfect use of your leftover turkey and cranberry sauce by making a cobb salad. 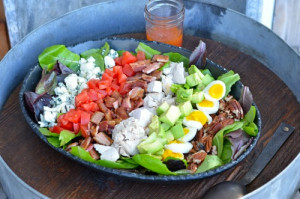 This salad uses layers of flavor – starting with cubes of turkey meat, tomatoes, avocado, blue cheese, bacon, boiled eggs and lots of fresh lettuce. 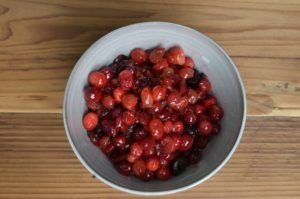 I use some leftover cranberry sauce to make the perfect vinaigrette – that is both slightly sweet and acidic at the same time. The best part is this meal is light and healthy after the excesses of Thanksgiving Day. 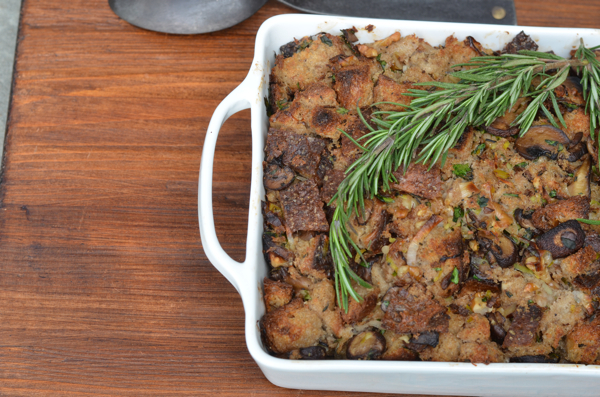 Look forward to this meal the day after Thanksgiving – there is nothing leftover about it! From by the bay, wishing you turkey leftover food memories! In a large salad bowl toss together assorted greens. In a skillet cook the bacon over moderate heat, stirring, until it is crisp and transfer it with a slotted spoon to paper towels to drain. Halve, pit, and peel the avocados and cut them into 1/2-inch pieces. Arrange the turkey, the bacon, the tomato, and the avocado decoratively over the greens and garnish the salad with the grated egg and the chives. In a small bowl whisk together the vinegar, the mustard, cranberry sauce and salt and pepper to taste, add the oil in a slow stream, whisking, and whisk the dressing until it is emulsified. Stir in the Roquefort. Whisk the dressing, pour it over the salad, and toss the salad well. This entry was posted in salads, side dish and tagged avocado recipes, blue cheese recipes, cranberry recipes, egg recipes, leftover recipes, salad, Thanksgiving recipes, tomato recipes, turkey cobb salad with cranberry vinaigrette, turkey recipes, vinaigrette recipes on November 25, 2015 by entertainingbythebay.